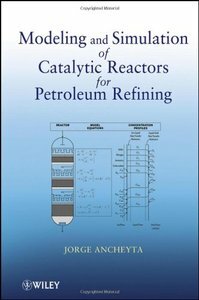 Modeling and Simulation of Catalytic Reactors for Petroleum Refining deals with fundamental descriptions of the main conversion processes employed in the petroleum refining industry: catalytic hydrotreating, catalytic reforming, and fluid catalytic cracking. Common approaches for modeling of catalytic reactors for steady-state and dynamic simulations are also described and analyzed. Aspects such as thermodynamics, reaction kinetics, process variables, process scheme, and reactor design are discussed in detail from both research and commercial points of view. Results of simulation with the developed models are compared with those determined at pilot plant scale as well as commercial practice. Kinetics data used in the reactor model are either taken from the literature or obtained under controlled experiments at the laboratory.